It's no secret that the risk of depression increases for women when their hormones are fluctuating. Especially vulnerable times include the menopause transition and onset of postmenopause. There's also postpartum depression that can erupt shortly after childbirth. But why do some women feel blue while others seem to skate through these transitions? One answer is provided through study results published in Menopause, the journal of The North American Menopause Society (NAMS). 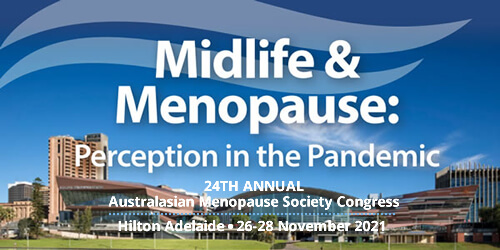 The article "Lifelong estradiol exposure and risk of depressive symptoms during the transition to menopause and postmenopause" includes data from a study of more than 1,300 regularly menstruating premenopausal women aged 42 to 52 years at study entry. The primary goal of the study was to understand why some women are more vulnerable to depression, even though all women experience hormone fluctuations. Previous studies have suggested a role for reproductive hormones in causing an increased susceptibility to depression. This study focused largely on the effect of estradiol, the predominant estrogen present during the reproductive years. Among other things, estradiol modulates the synthesis, availability, and metabolism of serotonin, a key neurotransmitter in depression. Whereas fluctuations of estradiol during the menopause transition are universal, the duration of exposure to estradiol throughout the adult years varies widely among women. A key finding of this study was that longer duration of estrogen exposure from the start of menstruation until the onset of menopause was significantly associated with a reduced risk of depression during the transition to menopause and for up to 10 years postmenopause. Also noteworthy was that longer duration of birth control use was associated with a decreased risk of depression, but the number of pregnancies or incidence of breastfeeding had no association. "Women are more vulnerable to depressive symptoms during and after the menopause transition because of fluctuating hormone changes," says Dr. JoAnn Pinkerton, executive director of NAMS. "This study additionally found a higher risk for depression in those with earlier menopause, fewer menstrual cycles over lifespan, or more frequent hot flashes. Women and their providers need to recognize symptoms of depression such as mood changes, loss of pleasure, changes in weight or sleep, fatigue, feeling worthless, being unable to make decisions, or feeling persistently sad and take appropriate action." Depression risk increases during the menopausal transition (MT) and initial postmenopausal years-both times of significant fluctuations of estrogen. Research to date provides limited support for the hypothesis that estrogen fluctuations play a role in the greater susceptibility to midlife depression. Importantly, not all women report depressive symptoms during the MT, and recent reports suggest that duration of exposure to estradiol throughout the adult years may also play a role in vulnerability to depression. This study examines patterns of estrogen exposure during the reproductive years and risk of depression during the MT and early postmenopausal years. A longitudinal, US community-based, multiethnic study of menopause. Data were collected at baseline and annually for 10 years, and included 1,306 regularly menstruating premenopausal women, aged 42 to 52 years at study entry. The main outcome was incidence of high level of depressive symptoms, Center for Epidemiological Studies Depression Scale (CES-D) score at least 16, in the MT and initial postmenopausal years, independent of premenopausal depression symptoms. Risk factors examined were duration of estrogen exposure(menarche to MT), duration of hormonal birth control use, pregnancies, and lactation. In a multivariate adjusted model, longer duration of estrogen exposure from menarche to MT onset was significantly associated with a reduced risk of depression (CES-D ≥16) during the MT and 10 years or less postmenopause (odds ratio 0.85, 95% confidence interval 0.78-0.92). Longer duration of birth control use was associated with a decreased risk of CES-D at least 16 (odds ratio 0.90, 95% confidence interval 0.83-0.98), but number of pregnancies or breastfeeding was not. Patterns of reproductive lifetime exposure to estrogen are associated with risk of high depressive symptoms during the MT and initial postmenopausal years; longer exposure to estrogen seemed protective.